Well what a hectic couple of weeks it has been since the week away on the River Trent. That seemed like months ago because so much has happened and work has been extremely busy! Well it is now Saturday and I was so ready for an extra long weekend. No work until Tuesday so I am making the most of it. Whilst the sun was still out today we decided to make our way out of the marina……….. engine started, reversed out of mooring……all going well then the heavens opened! We had also decided to fill up with diesel. Bad timing! As soon as we filled up the rain stopped thank goodness and off we set out of the marina……….decisions, decisions, do we go left or do we go right……. Left it was………..Decided to head to Ragley Boat stop for an extremely late lunch. Moored up right outside the pub (Ragley Boat Stop) where a lovely family made such a fuss of Wish! She is one spoilt dog. Plenty of belly rubs and lots of fuss by the family who also had a collie dog. Don’t forget send me the photo you guys when you read this! Everyone is so sociable out on the canalside. Nice to stop and chat rather than the constant running around during the working week. 4pm we sat down to eat and my goodness was I ready for it. Had an afternoon nap just like a little piggy…….belly full and off to sleep, I was just really tired. Not good to sleep at 5pm in the afternoon but it just had to happen, I was just sooooo tired. I was woken up around 6 ish by lots of shouting outside…….wondered what on earth had gone on. Another narrowboat had broken down and someone else had offered to tow them and another boat decided to help also. Went out to say hello and we moved our boat along a bit so all 4 boats could fit in. Perfect fit! Well before no time it was 7.30 pm and we had been given a tour of 2 of the other boats and they also came to look at ours. I find it amazing that we let total strangers on to our boat and yet we would never think of inviting strangers off the street to come and look around your house. Something different about the narrowboat world. Its like how the world used to be many decades ago……you can leave your doors open, windows open and have the freeness (if that is a real word) just to feel “free” 🙂 Relaxing feeling! 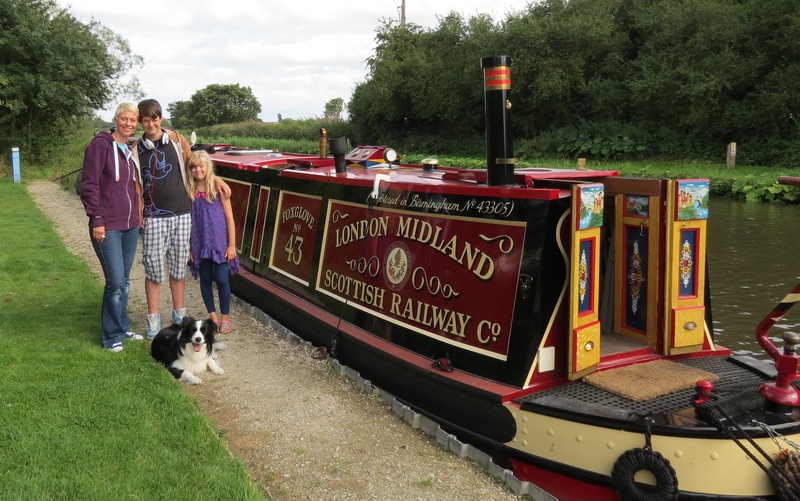 Not sure 1 couple understood the boatmans cabin………Emma & Nick if you are listening they are in agreeance with you……….engines should be below the decks!! Well the light has gone outside and Wish is shattered after having a good run out on the field playing with her ball. Just had cake and cup of tea and going to watch a film…….. I wonder what tomorrow will bring ?